Pain in the neck (and ear!) a thing of the past! 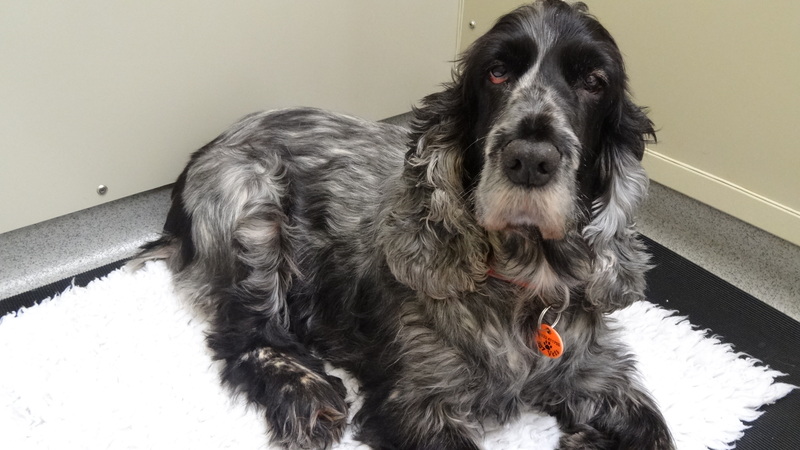 Like many spaniels, Holly suffered with ear problems. She had been attending a neighbouring vet practice for an infection in her right ear for over a year when we first saw her. She had a foul, overpowering smell from the purulent infection in her ear, caused by a destructive bacteria called Pseudomonas Aeruginosa. Medical treatment improved the smell and reduced the discharge from the ear and allowed a closed examination which showed that there was so much chronic, permanent change within the ear canal that it would prove impossible to resolve the infection without surgery. Persistent ear problems are most commonly caused by a build up of infected material in the middle ear, a bony socket sitting deep within the side of the head at the bottom of the long ear canal. It is impossible to clean out the middle ear in a conscious dog. It’s also extremely difficult to apply sufficient medication to penetrate through the debris that has built up in the ear in order to heal infection. 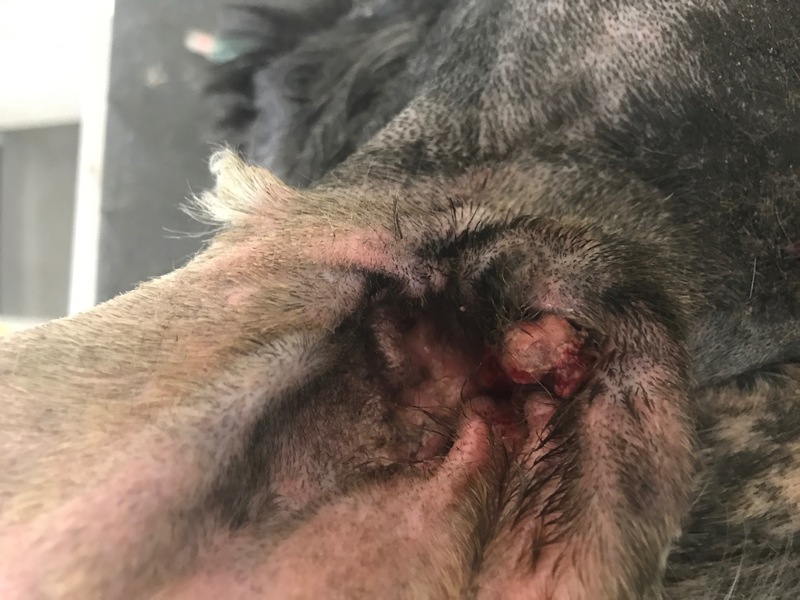 Many dogs with middle ear infections will develop a permanent problem, for which the only solution is repeat ear flushing under anaesthesia, or surgery. 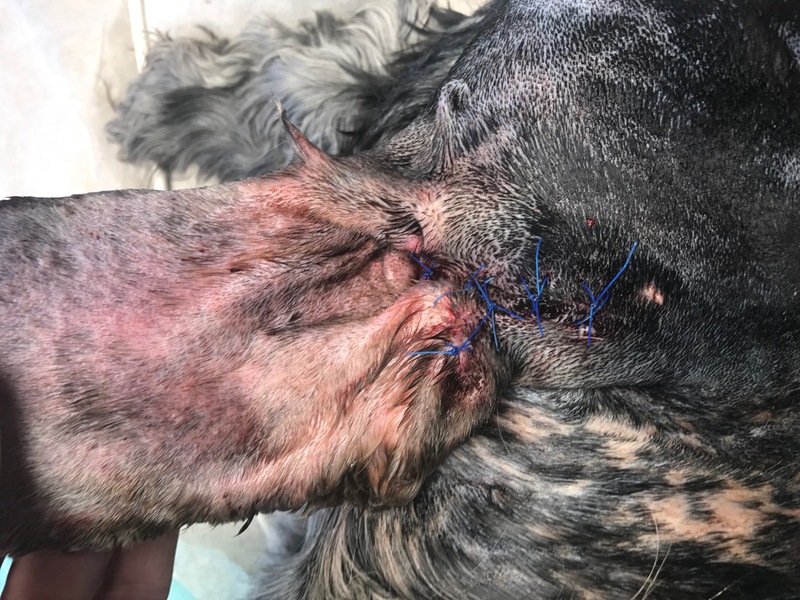 But in those dogs where the access and ventilation up and down the ear canal is permanently compromised, surgery is the only option for a successful outcome. The surgery (known as a total ear canal ablation and lateral bulla osteotomy, TECA-LBO) removes the entire ear canal and the bony side of the middle ear cavity, getting rid of all the infection and damaged tissue in one fell swoop. Although the surgery results in near deafness, many pets will already be deaf after long standing ear trouble. In Holly’s case, as the other ear was fine, her hearing was still ok. This surgery is technically very demanding because there are many extremely important structures in this area, including the facial nerve (which controls nearly all the muscles of the face, including the ability to blink), the inner ear (which controls balance) and some very large blood vessels. 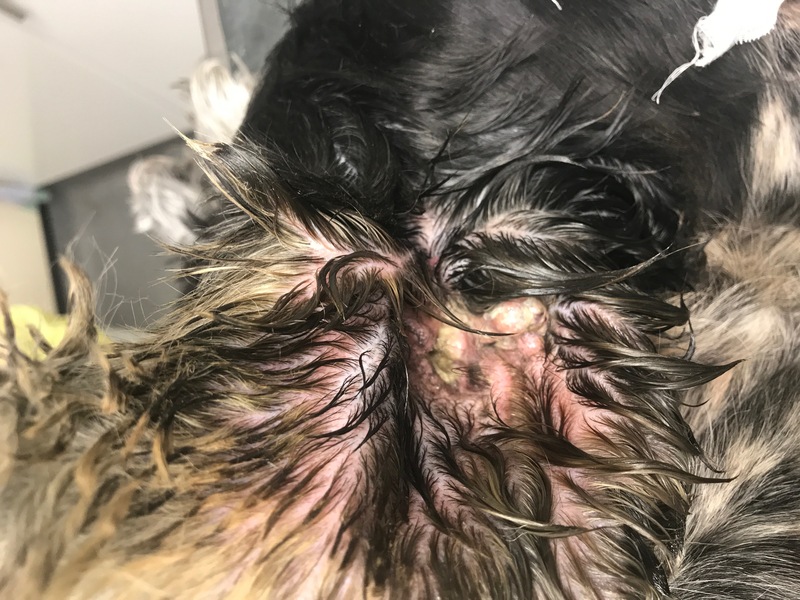 With patient and careful dissection, Holly’s surgery went very well, but the outcome of procedures like this cannot be certain until the dog has woken up and can be assessed for nerve damage. Holly had no complications and she is now a happy, comfortable, bright, lively spaniel without a pain (or smell) in the neck! Thanks to Holly’s owner for letting us showcase Holly as our 10th anniversary November Pet of the Month!